WHICH VITAMIX TO BUY? VITAMIX SMART SHOPPING! Thinking about buying a Vitamix this holiday season? I’m going to show you Which Vitamix To Buy the easy way. Smart Shopping for a Vitamix couldn’t be simpler with my recommendations. The biggest concern about buying Certified Reconditioned products is the feeling of them being used or repaired. Vitamix does not actually repair their blenders, but rather put them through a rigorous 17 point inspection. They verify motor operability, chips and cracks in the casing, check control panel for defects. All of which are replaced if they don’t pass inspection. You also get a new container with new or sanitized blades (depending on the age of the blades), new recipe book and a 3 or 5 year warranty that covers normal wear and tear. Certified Reconditioned Vitamix products are a steal! You can barely tell the difference between a reconditioned Vitamix and a new one. TOO MANY CHOICES OF VITAMIX MACHINES? WHICH VITAMIX TO BUY? The front page of my website has a clickable bar called “Henry Recommends This Vitamix”. It’s a very easy to use comparison chart for all Vitamix models. There is actually just 3 series of Vitamix blenders. The Classic/Legacy blenders. The Smart System blenders. The Space Saving blenders. My comparison chart has all 3 series listed. Click the last page of the chart and it reveals my Henry Recommends This Vitamix with dedicated needs of the consumer such as “Most affordable, “Top of the line, Best for chefs, Best for household cooks, etc. The Ninja blender is perhaps the most marketed blending product out there, but what you’re seeing is exactly that…Marketing! Time after time I get emails from my YouTube viewers who have said my reviews on Ninja blenders have been the same experience they have dealt with and were very disappointed in Ninja’s results. Ninja sells blenders for about $99 and claim that they are as good, if not better than a $500 Vitamix. They are not. Ninja grabs their customers by way of late night informercials for insomniacs. This is how they get into the consumer’s head to buy. If you want that commercial-quality blending experience, don’t buy a Ninja. They use cheap materials, very dangerous blades that are hard to clean, plastic gears and their warranties do not cover much of what’s inside the box. You will always get what you pay for. I always tell my viewers/customers if they want that same smoothie shop quality blend then buy the blender the smoothie shops use. That would be a Vitamix. The Vitamix Professional Series 500 has 3 Presets, Variable Speed Control and dedicated Pulse. It comes with the TALL 64oz container which is narrow at the bottom making it versatile for small or family-sized recipes. Combined with the Vitamix Personal Cup Adapter, the Tamper Holder and the Vitamix AER Disc container makes this a perfect holiday package! The Vitamix Explorian is the most affordable and simplest to operate. Offers Variable Speed Control and dedicated Pulse. 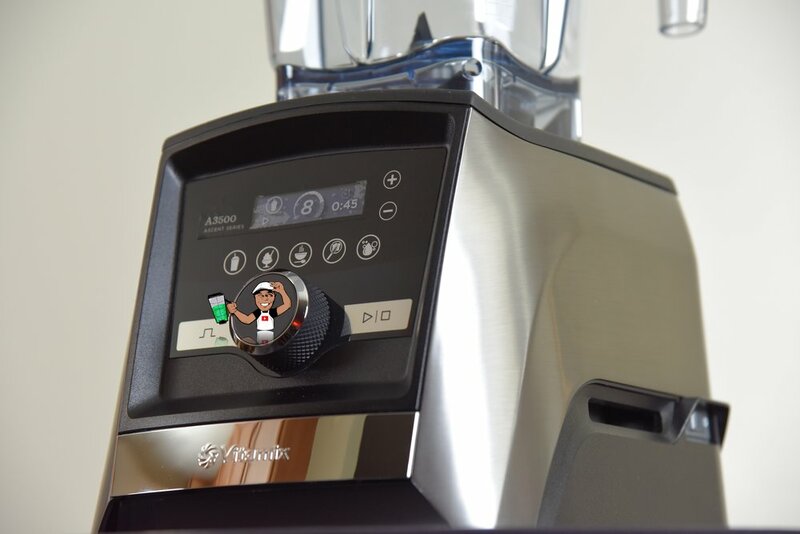 I recommend this model in my Vitamix comparison page as Best Bang for the Buck. My recommended holiday package includes the Vitamix Personal Cup Adapter and the Vitamix AER Disc Container. The Vitamix Professional Series 750 is my favorite Vitamix! It has 5 Presets, Variable Speed Control, dedicated Pulse, metal body and damping materials for quieter blending. Comes with the 64oz Container, Tamper and Recipe book. My recommended holiday package is the Vitamix Personal Cup Adapter, Vitamix Tamper Holder. Vitamix makes (3) 48oz containers that are compatible with all above mentioned models. The Wet Blade Container (for liquid-based recipes). The AER Disc Container (for emulsifying, whipping, muddling and foaming) and the Vitamix Dry Container for grinding, grains and milling spices. IS THE SPACE SAVING VITAMIX PERSONAL BLENDER FOR YOU? Since inception of the Vitamix Personal Blenders (S30-S50-S55) Vitamix has come out with solutions for their full-sized machines such as the Personal Cup Adapter for the legacy/classic machines and the Vitamix Self-Detect 20oz Cup & 8oz Bowl for the Smart System Ascent models. But there is still a market for the Personal Blenders. I generally recommend them for RV’s and Campers as well as college student’s dorm rooms where space is limited. Vitamix doesn’t make a boat load of accessories for the Personal Blenders so I would recommend to get the optional 20oz cup (shown on the left) as an extra blending cup for a second person to take on the go. The Vitamix Smart System Blenders are the latest line from Vitamix called Ascent. They offer high tech blending with very usable features, even if you’re not a “techie” person. The Vitamix Ascent line has features that vary from digital timer, touch controls and can be operated from your smartphone, new designed see-thru containers and the first Vitamix machines to come with a 10 year warranty. The Vitamix A2300 is the base model with digital on-screen timer, variable speed control and dedicated pulse. There’s a Vitamix A2500 for a bit more money which is the same as the A2300 but with (3) blending Presets. 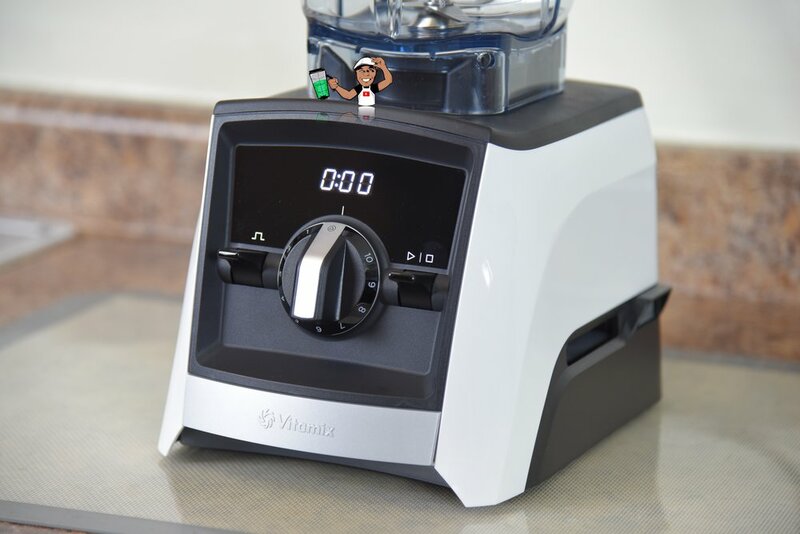 The Vitamix Ascent A3500 is the top of the line with digital on-screen timer, programmable timer, touch controls, professional-grade rotary variable speed dial, dedicated pulse and dampening materials for the quietest blending Vitamix offers for home use. There is a Vitamix A3300 for less money which is the same as the A3500 but with no presets. My recommendation for the ultimate Vitamix Smart System holiday package is the Self-Detect 20oz cup, the Self-Detect 8oz bowl, the Tamper holder (not shown) and the Vitamix Perfect Blend Scale for the simplest way to get the perfect blend every time. 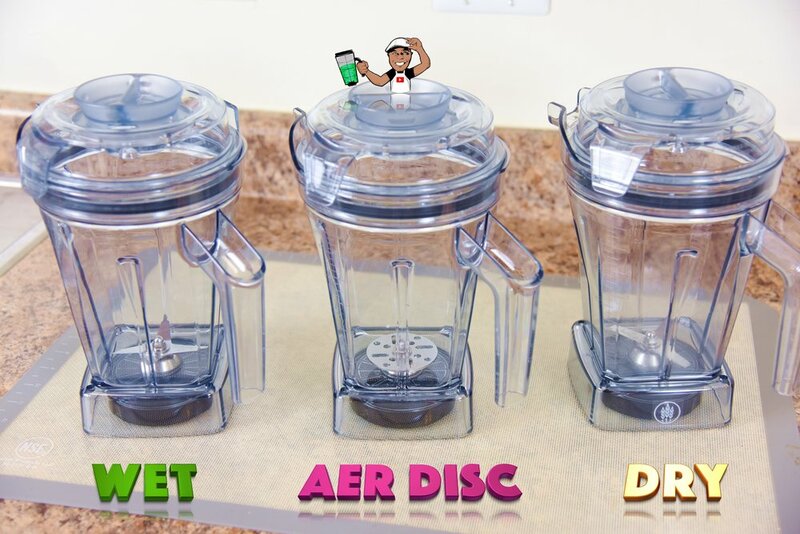 The Smart System blenders are fully compatible with the Vitamix 48oz Wet Blade, AER Disc and the Dry Blade containers. WHY DOESN’T VITAMIX OFFER GLASS BLENDING CONTAINERS? One of the most asked questions I get is why doesn’t Vitamix use glass containers for their blenders. When you go to Walmart you will see $29 blenders with glass containers. Those blenders are low in power and circulate the ingredients with very little pressure. Vitamix machines use commercial-grade motors which are very powerful and the way Vitamix blenders break down ingredients it creates a great deal of pressure which may easily crack a glass container. My opinion, but glass containers become too heavy for many people after loading them with ingredients. For those that have dexterity issues it would not be ideal. The Shark/Ninja company has targeted Vitamix for years, attempting to brainwash consumers into believing the Ninja blender is equally as powerful and capable as a Vitamix machine that cost “three times” the price. Well, making unsubstantiated over-the-top claims about their blenders was not the only deceptive business practice Shark/Ninja has attempted. If you purchase a Ninja blender in a retail store you will get a one year warranty. If you buy a Ninja blender from their website, depending on the model, you will get a “VIP LIFETIME WARRANTY”. What Shark/Ninja doesn't cover: Blending containers are not covered. The drive socket on the Ninja motor base is not covered. The warranty does not cover normal wear and tear. Finally, if Shark/Ninja has to replace your product they will reduce your warranty to two years. It’s a high probability that customers with the VIP Lifetime Warranty will get receive a replacement rather than a repair. This is how Ninja gets out of honoring their “lifetime warranty”. Do not fall for Ninja’s deceptive marketing practices. Their interest in customer satisfaction is at the bottom of their list. Check out my full video on YouTube for Which Vitamix to Buy called “Don’t Buy a Vitamix until you see this”. I answer 10 questions from my social media audience on Which Vitamix to Buy. It’s a full extension of this written blog. Click HERE to view. Happy Vitamix Shopping from Blending with Henry! You can order a Vitamix and the recommended accessories right from my website links on the front page, and fast free shipping is included. Offers and promos for USA, CANADA and the UK are listed when promotions are active. CLICK HERE TO RETURN TO THE FRONT PAGE!